Weather Now is all new. We're ecstatic to roll out a completely new visual design by Katie Zoellner. It's actually been lurking as a Beta site for several months. We didn't roll it out because not all of the features from our old site (see http://old.wx-now.com/) are complete. But today is the first day of a new year, which we thought an appropriate moment to finally give Katie's design some exposure. Notice the flags along the left side of this page. Is one of those flags from your country? Click on it. Almost everything on the site will automagically show up in your country's main language. We're still working on a lot of the translations, and some of them are tragicomically wrong. If you find a mistranslation, please let us know. We have plans to add a few more languages (does anyone speak Japanese, Mandarin, or Hindi? ), as well as to make the site better at guessing your preference. Also notice that you can now change easily between International System (metric) and English measurements. The site will get better at guessing each visitor's initial preference here, as well. All of the data pages use XML and XSL to provide the data you're looking for. This gives us much more flexibility, and allows us to vary the content much more than we've done in the past. Take the home page, for example. Each of the sections is independent of the others. Soon, you'll be able to mix and match them as you'd like, or choose from one of the themes that we'll offer. The Site now uses the Inner Drive Extensible Architecture™ throughout. The Idea™ underpins all Inner Drive Technology applications, of which this is our biggest demonstration. We have a lot more cool tools planned for the site, including a massive upgrade of the geographical gazetteer that holds all of our place information and some neat things to do with your mobile PC. National Security Council veteran Rand Beers has called this the "7-year-old's soccer syndrome"—just like little kids playing soccer, everyone forgets their particular positions and responsibilities and runs like a herd after the ball. Without the distraction of the Iraq war, the administration would have spent this past year—indeed, every year since Sept. 11, 2001—focused on al-Qaeda. But beyond al-Qaeda and the broader struggle for peaceful coexistence with (and within) Islam, seven key "fires in the in-box" national security issues remain unattended, deteriorating and threatening, all while Washington's grown-up 7-year-olds play herd ball with Iraq. Clarke's list of crises that merit attention, but haven't gotten any from the White House, will surprise exactly no one who has paid attention for the last five years. I'm an hour late getting in TDP, for which I'm sorry. Today was the last business day of 2006, and possibly Parker's last day in the office for a while (I'll be working downtown starting next month). Fittingly, here's Parker, doing what he does best: being a good office puppy. Notice that in 2007, Daylight Saving Time lasts a lot longer than in years past: from the second Sunday in March through the first Sunday in November. This actually makes the autumn a little darker, as you can see from the chart. You can get sunrise information for your location at wx-now.com. I'm going to bet that no one takes it before the trash haulers find it. I might even bet that they will leave it behind, too. I got my first camera in June 1983. Now, more than 23 years later, I'm scanning all the old slides and negatives. It's a little trippy. 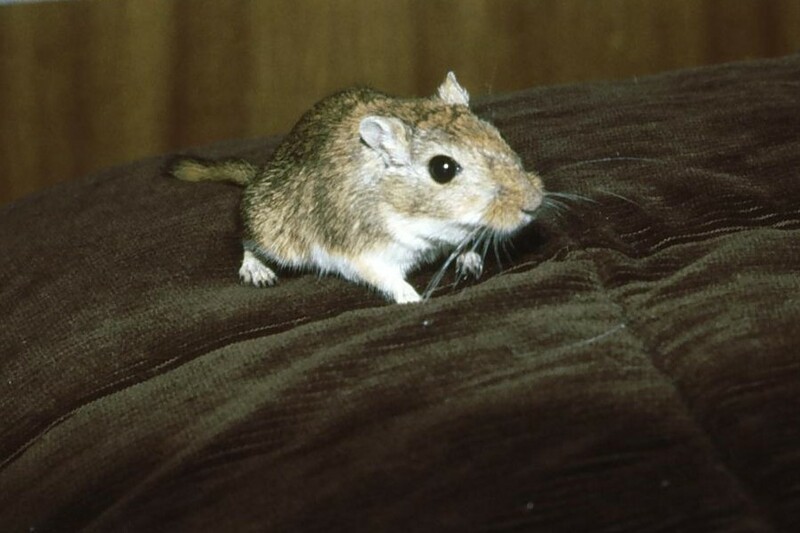 I keep finding things like this photo of the pet gerbil I had back then. I've also found a whole bunch of documentary shots around Northbrook, Ill., where I grew up. I'll re-shoot some of these at some point and post some then-and-now views. 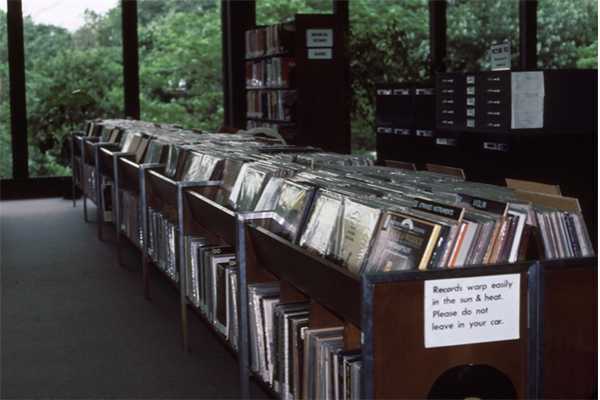 Here's a preview: the LP stacks at the Northbrook Public Library. They were still about two years from their first CD player. Parker is back in the office! We had quite a full weekend. We drove down to see the in-laws in St. Louis, and for the first time on a drive of any length, Parker didn't puke. If you've never dealt with a car-sick puppy before, you can't fathom how important this is. Trust me. While in St. Louis, Parker met my brother-in-law's dog, Biscuit. She's 18 months old (to Parker's 6), and about the same size (18 kg, 40 lbs). Plus, she's cute. I think Parker's smitten. They played for the entire weekend, and only had one minor scrap over property rights when Biscuit tried to walk off with the bully stick Parker was gnawing. A crew of mechanics at Istanbul's airport were so glad to be rid of some trouble-prone British-made airplanes that they sacrificed a camel on the tarmac in celebration—prompting the firing [December 13] of their supervisor. Turks traditionally sacrifice animals as an offering to God for when their wishes come true. So...does this mean God did not accept the sacrifice? I haven't really formed an opinion on Sen. Obama's office giving an internship to the son of a guy who gave $10,000 to the 2004 campaign. I'm not really surprised, nor do I really think it's a big deal. I've got a sort-of meta-concern about it, because I think it presages the kinds of stories we'll have to read every week after Obama announces he's running for President. Perhaps I've just got a typical native Chicagoan's indifference to petty nepotism. I'm wondering if this hints at a deeper connection with Rezko that will come out closer to the primaries next Winter. Or if, as it appears from the pro-Obama camp, this looks more like Rezko trying to get in with Obama, who in turn sensed the danger and kept Rezko at arm's length. I'm sure we'll hear more about it over the summer.